Phenomena associated with the turbulent flow of molten steel in a continuous-casting mold are responsible for many defects in the final product, including surface slivers, frozen meniscus hooks, captured inclusions that enter the mold from upstream, and mold slag entrapment. Animations of some of these transient flow phenomena are presented from large-eddy simulations of a typical slab caster with a three-port nozzle. The illustrated phenomena include the transport of superheat with the turbulent transient flow of molten steel, surface-level fluctuations, and the transport and entrapment of inclusion particles. The quality of continuous-cast steel is greatly influenced by fluid flow in the mold, particularly at the meniscus. Significant previous research has investigated this using plant experiments,1 water models,2 and computational models,3–7 which is beyond the scope of this work to review. Animations of the transient flow pattern were presented previously.8 The current work focuses on animations of the accompanying phenomena that lead to defects. The flow pattern is controlled by the nozzle and mold geometry, casting speed, and sometimes also by electromagnetic forces, or the buoyancy force from introduced gas bubbles. It varies greatly with time, even for nominally steady casting conditions. Understanding the flow pattern is a difficult and important step, but the flow pattern itself is not of direct concern to steel quality. Further computations of associated phenomena such as superheat transport, top-surface-level fluctuations, and the movement and entrapment of inclusion particles yield more practical insights into defect formation.6 This work illustrates turbulent fluid flow and related phenomena leading to defect formation in continuous casting, based on animations of computational model simulations of these phenomena at the University of Illinois for a typical continuous-caster configuration. The simulations of turbulent fluid flow in this work are achieved by computational brute force: solving the three-dimensional Navier Stokes equations on a fine grid of over 1.5 million nodes with time steps of 0.001 s. The simulations were performed with an in-house code, UIFLOW, which uses the Harlow-Welch fractional step discretization on a staggered grid, second-order central differencing for the convection terms, the Adams-Bashforth scheme for time discretization, and the Crank-Nicolson scheme for the diffusion terms.11 The minor effects of turbulence from the sub-grid scale eddies were modeled with the standard Smagorinsky model. Even with an efficient algebraic multigrid solver to handle the complex, unstructured geometry, the simulations are quite slow and took 29.5 central-processing-unit seconds per time step on a Pentium IV 1.7 GHz personal computer for the 1.3 million cells grid or 24 days for 70,000 time steps (70 s of real time). Animations of the fluid flow velocities in the nozzle region of this caster are presented in Figure 2.20 Note the significant asymmetry in the instantaneous snapshot of the flow pattern in the nozzle, both around the stopper rod (Figure 2a, Animation 1) and at the nozzle ports (Figure 2b, Animation 2). Flow varies chaotically between sides, and exhibits significant asymmetry in spite of the perfectly symmetrical domain. This is characteristic of the “pseudo-steady” state of this turbulent flow, even after long-time operation. The downward angle of the two side jets leaving the nozzle ports varies in time from ~30° to 45°. The chaotic flow continues into the mold region, where variations between sides persist and grow. The streamlines in Figure 3 compare the predicted time-averaged flow pattern in half of the mold with a photograph of die injection in a full-scale water model of the process.13 Animation 3 shows the transient flow pattern in the water model, visualized using die injection. Animation 4 shows the corresponding LES computation, in the full-mold domain. 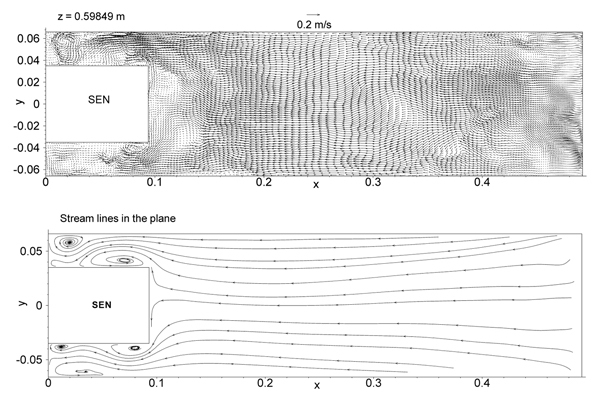 A typical snapshot of this flow pattern is given in Figure 4.11 In both cases, the jets exhibit asymmetry between sides which fluctuate over time, but the flow patterns roughly match. The upper and lower roll structures each evolve chaotically between a single large recirculation structure and a complex set of evolving smaller structures and vortices. Fast- and slow-moving flow structures alternate chaotically along the top surface, sometimes producing time periods with velocity much greater than the mean. Computing the flow pattern is the first step in predicting the phenomena related to defects discussed in the next sections. Impingement of the molten steel jets onto the solidifying shell in the mold can cause problems if the jet is either too hot or too cold. A jet with excessive superheat can cause the solidifying shell to melt at the impingement point near the narrow face corners, leading to a breakout if thinning persists past the mold exit.23–25 However, a jet with insufficient superheat can deliver steel to the top surface that is too cold, which leads to surface skulling, freezing of the meniscus, and related surface defects. Figure 5 shows a typical snapshot of the temperature distribution in this caster.13 The superheat drops as the steel moves from 57°C at the outlet ports (red) to only a few degrees at the coldest locations found at the meniscus (perimeter of the top surface), especially near the SEN and the narrow face and corners. Temperature measurements down the middle of the upper recirculation region match the local predictions of ~17°C superheat.13 Animation 5 illustrates the evolution of the flow vectors in half of the mold (left) and the corresponding temperature distribution (right), which varies with time and position according to the transport of superheat within the liquid steel. Very cold (blue) regions appear intermittently near the narrow face meniscus (top right corner). Supercooling of the liquid in this manner tends to freeze the meniscus, initiating deep subsurface hooks and deep oscillation marks in this location.26 The transient cold eddies revealed in this animation explain why hook depth varies with position both along and down the cast strand. Controlled oscillation of the mold generates ripples across the liquid level, but does not present an inherent quality problem because the liquid near the mold wall tends to move with the wall. Large, sudden jumps or dips in liquid level are much more serious, however. Variations in the top surface liquid level caused by momentum variations in the turbulent flowing liquid were computed from the velocity simulation results. A sudden jump in local level can cause molten steel to overflow the meniscus. In the worst case, the steel can stick to the mold wall and start a sticker breakout. Alternatively, a sudden change in level can aggravate local meniscus freezing, causing a deep subsurface hook structure and a deep oscillation mark. The hooks entrap inclusion particles, while the oscillation mark roots are susceptible to transverse cracks, leading to surface defects in both cases.4 Variations of more than the oscillation stroke over a time interval on the order of 1s are the most detrimental. The level fluctuations observed here are relatively small compared with the large variations associated with unstable flow or high casting speeds. The flow pattern also directly controls the transport and entrapment of inclusions, bubbles, slag, and other particles, which is a critically important quality concern. Inclusion entrapment requires expensive inspection, surface grinding, and even rejection of the final product. Furthermore, if undetected, large particles lower the fatigue life, while captured bubbles and inclusion clusters cause slivers, blisters, and other surface defects in rolled products. These particles have two main sources: bubbles and inclusions generated during upstream processing which enter the mold through the submerged entry nozzle, and the entrainment of mold slag from the top surface of the mold, discussed in the next section. Inclusions exiting the submerged nozzle may either float to the top surface and become entrained harmlessly into the slag layer or may be trapped in the solidifying front, leading to defects such as internal cracks and slivers in the final rolled product. Determining where these inclusions finally end up is thus quite important to quality. Figure 7a shows snapshots taken at three times from the 100-second video, Animation 7 of the trajectories of 10,000 100-μm inclusion particles injected into the caster.15 Red indicates the final entrapped or refloated location of the particle, and blue indicates particles that are still moving. Particles exiting the bottom of the domain are entrapped lower in the caster. Note the strong asymmetric flow, as chaotic flow variations send stronger flow down one side of the caster, carrying more particles deeper into the caster than the time-averaged flow pattern would suggest. Trajectory 1 shows a particle that exited the left nozzle port, recirculated around the upper roll and eventually touched the top surface to be removed. Trajectory 2 shows a particle entering the mold from the center port, being drawn upward into the left side, recirculating, and finally reaching the top surface. Trajectories 3 and 4 show particles flowing out the bottom of the domain after wandering between the upper and lower rolls or moving directly with the flow down the narrow faces into the lower region. These particles would most likely be entrapped in the final product. Trajectory 5 shows a particle that became entrapped at the wide face approximately 0.8 m below the top surface. Tabulating the particle statistics reveals that only ~8% of the small particles entering the mold from the nozzle reach the top surface to be safely removed. Larger particles, such as the 100-μm inclusions animated here, are removed more easily owing to their greater buoyancy and ease of escaping capture by being washed from the solidification front. However, removal rates are still small: 13%, 42%, and 70% for 100 μm, 250 μm, and 400 μm particles, respectively. These predictions are consistent with measurements and suggest that inclusions should be removed during upstream processing, while the flow pattern in the mold should be controlled to optimize surface turbulence and temperature to avoid surface problems. Mold slag can be entrained into the solidifying shell due to vortexing, high velocity flow that shears slag from the surface, and turbulence at the meniscus. The capture of large inclusions into the solidifying shell then leads to obvious line defects or “slivers” in the final product. Mold slag defects arise in two stages: first, emulsifying the slag into droplets entrained in the steel and second, transporting the slag inclusions to become entrapped in the solidifying steel shell. Slag emulsification can arise through shearing off of slag fingers due to excessive surface velocity or by vortexing. Vortexing most often occurs during conditions of asymmetrical flow, where steel flows rapidly through the narrow passage between the SEN and the mold. Even without asymmetric flow between halves of the mold, flow past the SEN causes swirling regions to appear and disappear in the critical region between the SEN and shell, as shown in Animation 8 and Figure 8.13 This can lead to sliver formation and longitudinal cracks near the strand centerline. This swirling flow hastens erosion of the nozzle refractory walls. Visible erosion patterns at the locations near the off-corner and center of the wide thin-slab nozzle have been observed in practice, corresponding closely to the locations where swirl is observed in the animations. With more severe flow conditions, the swirls or vortex may draw mold slag downward, near the sides of the nozzle. This is most likely with higher surface velocities (>0.4m/s),27 or if there is asymmetric flow from one side to the other. In addition to the vortex, slag may also be drawn downward by the recirculation pattern that accompanies flow from the nozzle ports. Thus, slag entrainment is most likely with shallow nozzle submergence and high casting speed. The fate of these particles is illustrated in Figure 9 and Animation 9.18 Many of the slag particles quickly float back to the surface, (red, representing almost 50% in this example). If emulsified slag particles are drawn deep enough to become entrained with the jets exiting the nozzle ports, however, this animation illustrates how the slag particles are transported everywhere, (blue) creating inclusion defects wherever they are entrapped in the shell (red). This particle behavior is the same as that of particles entering through the nozzle ports. Mold slag entrainment is one of the most common preventable causes of serious defects in the cast product. Animations of fine-grid LES computations are applied to illustrate several phenomena associated with transient fluid flow, which are important to defect formation during the continuous casting of steel. The computations focus on a typical medium-thickness slab caster, with a stopper-controlled, three-port submerged entry nozzle, where extensive water model with plant measurements were available for model validation. The animations reveal important insights into the flow-related phenomena that lead to defect formation. Animations of the turbulent flow field reveal asymmetries that start at the stopper rod. Strong jets of molten steel surge through the nozzle exit ports, revealing time-varying recirculation zones in the upper regions of the ports. Flow in the mold cavity exhibits a classic double-roll pattern that varies with time. Complex vortex structures evolve and decay in both the upper and lower recirculation zones. Although asymmetric flow through the nozzle greatly affects flow in the mold, chaotic variations arise due to turbulence alone. Superheat accompanying the flow is smallest in the farthest regions at the top surface near the meniscus at the narrow face and the SEN. These regions intermittently become cold, leading to meniscus freezing, deep oscillation marks, and subsurface hooks, which create surface defects. Flow across the top surface creates vortexes, especially near the SEN. A profile of the top surface reveals time-dependent level fluctuations, which aggravate surface defects. Particles entering the mold through the ports tend to circulate with the flowing liquid. Relatively few particles are able to reach the top surface, to be safely removed into the slag layer. Most (~90%) of small inclusion particles eventually touch the solidifying dendritic interface to become trapped between the dendrites. Slightly fewer large inclusions and bubbles are entrapped as defects, owing to their greater buoyancy and the chance of them being washed away from the dendritic interface. Finally, mold slag particles may become emulsified at the top surface, especially near the SEN where vortices are generated. Those slag particles that do not immediately rejoin the slag layer can become entrained into the steel jet and be distributed throughout the mold cavity. They are just as likely to become to become entrapped in the final product as particles entering through the nozzle. The insights generated through these animations foster better understanding of how defects form, and facilitate technologies to overcome them. The authors wish to thank the National Science Foundation (Grants DMI 01-15486 and DMI 04-23794) and the Continuous Casting Consortium at the University of Illinois at Urbania-Champaign (UIUC) for support of this research, FLUENT Inc., for providing the FLUENT code, and the National Center for Supercomputing Applications at UIUC for computing time. Additional thanks are extended to R. O’Malley and AK Steel for the experimental measurements used in model validation. 1. J. Knoepke et al., “Pencil Blister Reduction at Inland Steel Company,” Steelmaking Conf. Proc., Vol. 77 (Warrendale, PA: ISS, 1994), pp. 381–388. 2. P.H. Dauby, M.B. Assar, and G.D. Lawson, “PIV and MFC Measurements in a Continuous Caster Mould. New Tools to Penetrate the Caster Black Box,” La Revue de Metallurgie - CIT, 98 (4) (2001), pp. 353–366. 3. B.G. Thomas, L.J. Mika and F.M. Najjar, “Simulation of Fluid Flow Inside a Continuous Slab Casting Machine,” Metall. Trans. B, 21B (2) (1990), pp. 387–400. 4. B.G. Thomas, “Chapter 14. Fluid Flow in the Mold,” Making, Shaping and Treating of Steel: Continuous Casting, Vol. 5, ed. A. Cramb (Pittsburgh, PA: AISE Steel Foundation, 2003), pp. 14.1–14.41. 5. B.G. Thomas and L. Zhang, “Review: Mathematical Modeling of Fluid Flow in Continuous Casting,” ISIJ Internat., 41 (10) (2001), pp. 1181–1193. 6. B.G. Thomas, “Modeling of Continuous-Casting Defects Related to Mold Fluid Flow,” Iron and Steel Technology (AIST Transactions), 3 (7) (2006), pp. 128–143. 7. B.G. Thomas, “Chapter 5. Modeling of Continuous Casting,” Making, Shaping and Treating of Steel: Continuous Casting, Vol. 5, ed. A. Cramb (Pittsburgh, PA: AISE Steel Foundation, 2003), pp. 5.1–5.24. 8. B.G. Thomas, “Casting Process Simulation and Visualization: A JOM-e Perspective,” JOM, 54 (1) (2002), pp. 20–21. 9. B.G. Thomas and F.M. Najjar, “Finite-Element Modeling of Turbulent Fluid Flow and Heat Transfer in Continuous Casting,” Applied Mathematical Modeling, 15 (5) (1991), pp. 226–243. 10. W.H. Emling et al., “Subsurface Mold Slag Entrainment in Ultra-Low Carbon Steels,” Steelmaking Conf. Proc., Vol. 77 (Warrendale, PA: ISS, 1994), pp. 371–379. 11. Q. Yuan, B.G. Thomas, and S.P. Vanka, “Study of Transient Flow and Particle Transport during Continuous Casting of Steel Slabs, Part 1. Fluid Flow,” Metall. & Mater. Trans. B., 35B (4) (2004), pp. 685–702. 12. B.G. Thomas, R.J. O’Malley, and D. Stone, “Measurement of Temperature, Solidification, and Microstructure in a Continuous Cast Thin Slab,” Modeling of Casting, Welding, and Advanced Solidification Processes VIII, ed. B.G. Thomas and C. Beckermann (Warrendale, PA: TMS, 1998), pp. 1185–1199. 13. B. Zhao et al., “Transient Fluid Flow and Superheat Transport in Continuous Casting of Steel Slabs,” Metall. & Mater. Trans. B, 36B (6) (2005), pp. 801–823. 14. Y. Meng and B.G. Thomas, “Simulation of Microstructure and Behavior of Interfacial Mold Slag Layers in Continuous Casting of Steel,” ISIJ International, 46 (5) (2006), pp. 660–669. 15. Q. Yuan, B.G. Thomas, and S.P. Vanka, “Study of Transient Flow and Particle Transport during Continuous Casting of Steel Slabs, Part 2. Particle Transport,” Metal. & Material Trans. B, 35B (4) (2004), pp. 703–714. 16. Q. Yuan et al., “Study of Computational Issues in Simulation of Transient Flow in Continuous Casting,” Materials Science & Technology 2004, Vol. II (Warrendale, PA: TMS, 2004), pp. 333–343. 17. B.G. Thomas, R.J. O’Malley, and D.T. Stone, “Measurement of Temperature, Solidification, and Microstructure in a Continuous Cast Thin Slab,” Modeling of Casting, Welding, and Advanced Solidification Processes, Vol. VIII, ed. B.G. Thomas and C. Beckermann (Warrendale, PA: TMS, 1998), pp. 1185–1199. 18. Q. Yuan and B.G. Thomas, “Transport and Entrapment of Particles in Continuous Casting of Steel,” 3rd Internat. Congress on Science & Technology of Steelmaking (Warrendale, PA: Association for Iron & Steel Technology, 2005), pp. 745–762. 19. Q. Yuan, “Transient Study of Turbulent Flow and Particle Transport During Continuous Casting of Steel Slabs” (Ph.D. thesis, University of Illinois at Urbana-Champaign, IL, 2004). 20. Q. Yuan et al., “Study of Computational Issues in Simulation of Transient Flow in Continuous Casting,” Steel Research International, 76 (1, Special Issue: Simulation of Fluid Flow in Metallurgy) (2005), pp. 33–43. 21. Q. Yuan et al., “Computational and Experimental Study of Turbulent Flow in a 0.4-Scale Water Model of a Continuous Steel Caster,” Metall. & Mater. Trans. B, 35B (5) (2004), pp. 967–982. 22. B.G. Thomas et al., “Comparison of Four Methods to Evaluate Fluid Velocities in a Continuous Casting Mold,” ISIJ Internat., 41 (10) (2001), pp. 1266–1276. 23. B.G. Thomas et al., “Validation of Fluid Flow and Solidification Simulation of a Continuous Thin Slab Caster,” Modeling of Casting, Welding, and Advanced Solidification Processes, Vol. IX (Aachen, Germany: Shaker Verlag GmbH, 2000), pp. 769–776. 24. G.D. Lawson et al., “Prevention of Shell Thinning Breakouts Associated with Widening Width Changes,” Steelmaking Conf. Proc., Vol. 77 (Warrendale, PA: ISS, 1994), pp. 329–336. 25. B.G. Thomas, A. Moitra, and R. McDavid, “Simulation of Longitudinal Off-Corner Depressions in Continuously-Cast Steel Slabs,” ISS Transactions, 23 (4) (1996), pp. 57–70. 26. J. Sengupta et al., “Mechanism of Hook Formation during Continuous Casting of Ultra-low Carbon Steel Slabs,” Metall. & Mater. Trans. A, 37A (5) (2006), pp. 1597–1611. 27. J. Kubota et al., “Meniscus Flow Control in the Mold by Travelling Magnetic Field for High Speed Slab Caster,” Mold Operation for Quality and Productivity, ed. A.W. Cramb and E. Szekeres (Warrendale, PA: Iron and Steel Society, 1991). B.G. Thomas, Q. Yuan, B. Zhao, and S.P. Vanka are with the Department of Mechanical Science & Engineering at the University of Illinois at Urbana-Champaign. For more information, contact B.G. Thomas, University of Illinois at Urbana-Champaign, Department of Mechanical Science & Engineering, 140 Mechanical Engineering Building, 1206 West Green Street, Urbana, IL 61801; (217) 333-6919; fax (217) 244-6534; e-mail bgthomas@uiuc.edu.